United Nations Secretary General Kofi Annan has said the scale of the Indian Ocean tsunami disaster demands an unprecedented world response. He said the international community had reacted well to the wave aftermath but long-term commitment was required. The World Bank, individual countries and citizens have pledged $500m in aid. The death toll from Sunday's disaster is continuing to rise as relief workers reach more remote areas. More than 123,000 people are now confirmed dead. Thousands of people remain unaccounted for after the 9.0-magnitude undersea earthquake off Sumatra sent a wall of water smashing into coastlines as far away as east Africa. 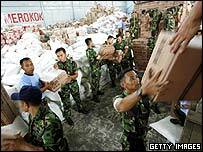 Aid agencies have been struggling to provide relief to the region. The World Health Organization says as many as five million people are at risk, with little water, food or shelter. US Secretary of State Colin Powell will meet Mr Annan on Friday before setting off on a visit to tsunami-hit areas on Sunday. Mr Annan said after a meeting in New York with UN officials that the entire UN family was ready to help people rebuild their lives. But he said there was an enormous strain on the UN, its staff and resources, and the disaster was so huge that no single country or agency could cope alone. "This is an unprecedented global catastrophe and it requires an unprecedented global response," he said. "But we must also remain committed for the longer term. We know that the impact will be felt for a long time to come." The World Bank has announced it is giving $250m to help victims while the UK increased its contribution to $96m, the biggest donation from an individual country. The International Red Cross has opened a special website to cope with what it describes as the overwhelming amount of donations. Support is also growing for a debt moratorium for some of the stricken countries, with France backing a proposal made by Germany. Canada has announced its own unilateral moratorium. Italy called for an extraordinary G8 summit to discuss debt relief, but UK Prime Minister Tony Blair said it was the job of the UN not the G8 to co-ordinate aid. Mr Powell agreed the UN had chief responsibility for co-ordinating the aid effort, despite a move by Washington to set up a core group of donor countries with India, Australia and Japan. Donors were considering holding a conference next week, he said. Mr Powell go to the affected region with US President George W Bush's brother Jeb, who has experience of handling natural disasters as governor of Florida, which was hit by three devastating hurricanes this year. There are problems getting aid through to where it is needed as much of the region's infrastructure has been shattered. Stockpiles of supplies have begun to mount at some airports and distribution centres, where helicopter shortages have held up airlifts of aid. Health ministry officials in Indonesia put the death toll there at 79,940 on Thursday after large numbers of bodies were found on Sumatra's remote north-west coast. Government institutions in the region have collapsed and fuel supplies have almost run out, officials said. On Thursday, aftershocks off Indonesia triggered fresh panic among survivors in Aceh, the worst-hit province. Rumours of impending waves quickly spread to the two other countries which bore the brunt of Sunday's tsunamis - India and Sri Lanka - prompting a mass flight from coastal areas.